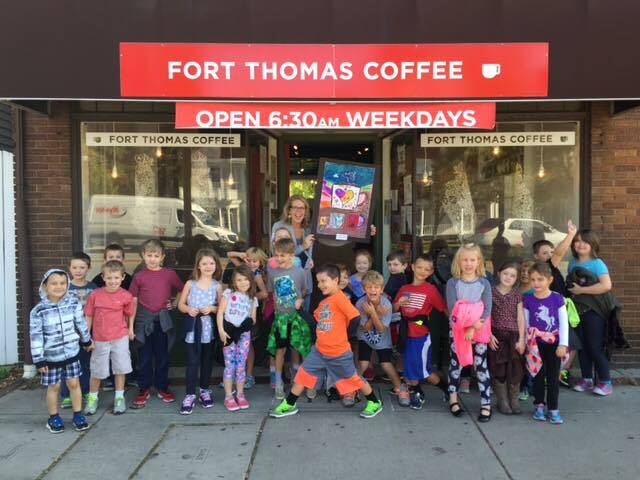 Moyer Elementary first graders deliver artwork to Fort Thomas Coffee. The next time you're mailing a package at the U.S. Postal Service office on North Fort Thomas Ave., buying breakfast at Top This Donut Bar or checking out a book at the Carrico/Fort Thomas branch of the Campbell County Public Library, take a moment to look at the artwork on display, proudly made by first graders at Ruth Moyer Elementary. Nikki Everett, Visual Arts Teacher for Fort Thomas Independent Schools (FTIS), reached out to more than 20 businesses to partner with her first-grade classes. Although she has partnered with Starbucks and St. Elizabeth Ft. Thomas in the past, this is the first year elementary art classes have partnered with businesses all over the city. 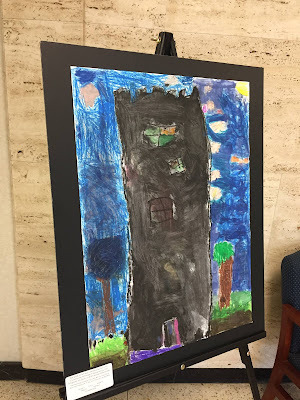 "The big idea we talk about in art during the first quarter is community, and the first graders are learning about jobs and writing what they want to be when they grow up," Everett says. "I wanted to make connections with their curriculum in the classroom and be able to reach out to our own community to make it an authentic, real-world and memorable learning experience." 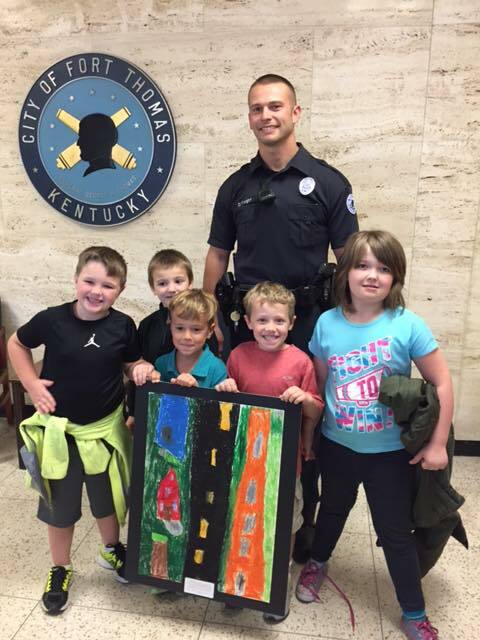 Students in Nikki Everett's art class deliver a collaborative painting to the Fort Thomas Police Department. Pictured here is Derek Faught. Another painting went to the Fort Thomas Independent Schools Board of Education office. Pictured here with Ginger Webb and Gene Kirchner. Everett, who has been teaching elementary art with FTIS for 14 years, personally visited Fort Thomas Coffee, the FTIS Board of Education office and the Fort Thomas Police Department with Jillian Hurtt's first-grade class. "Each teacher walked her class to three different businesses," Everett says. "You should be able to see the work at other offices and businesses on the Avenue, which include the U.S. Postal Service office, 15 North Pizza, Top This Donut Bar, Belladance, Fort Thomas Central, the Fort Thomas Fire Department, Fifth Third Bank, the City Building and Bowman's Framing. The students completed the work in art class and then walked to each business to deliver the work. 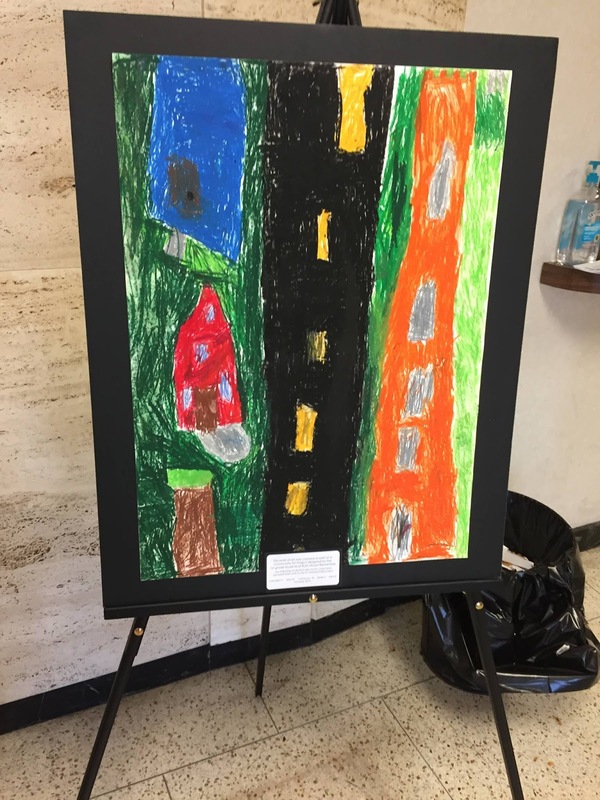 The businesses, in return, talked to the students about their job in the community and agreed to display the work." Other businesses that are displaying artwork but that are out of walking distance include Carmel Manor, Fort Thomas Antiques & Design Center, Campbell County Public Library, St. Elizabeth Fort Thomas, Midway Cafe, Campbell County YMCA, Graeter's and Barre3. Employees at these businesses came to the students' classrooms to pick up the work and talk about their careers. Each class worked in groups to research different businesses in Fort Thomas. "They used an iPad to search for images that they thought would be appropriate for each specific business," Everett says. "We brainstormed ideas, practiced and planned our projects. The hardest part was learning to make choices as a group on what to include in the painting. For Fort Thomas Coffee, the students decided to make one large mug and several smaller mugs with the logo 'I love coffee.' We talked about color choices and using big shapes since we were using 22" x 28" papers." The 'I love coffee' painting on display at Fort Thomas Coffee. FTM file. 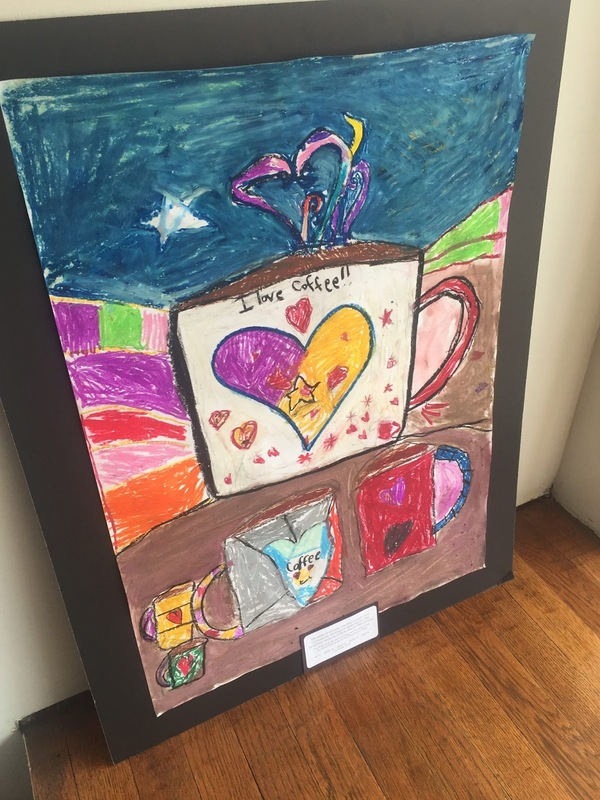 Fort Thomas Coffee Owner Lori Valentine's 7-year-old daughter, Kit, helped create the artwork for her coffee shop. "They were so excited to share their work and hear about business," Valentine says. "Kit was excited to show her classmates the coffee shop, too. I was particularly excited to hear many of the kids saying, 'I love this place!' as they walked in." Valentine says the mission at Fort Thomas Coffee has always been to deepen connections and community in Fort Thomas. "I see artwork as a natural way to share the many talents of our awesome community," Valentine says. "Our schools are a vital piece of our community. Since we opened 4-1/2 years ago, we have supported the schools in many ways, including an annual art display by Highlands High School." The artwork displayed at Bowman's Framing. FTM file. Bowman's Framing is regularly filled with artwork, including original works from Dale Benedict, Jack Meanwell, Robert Fabe, Beverly Erschell and Joanne Honschopp. 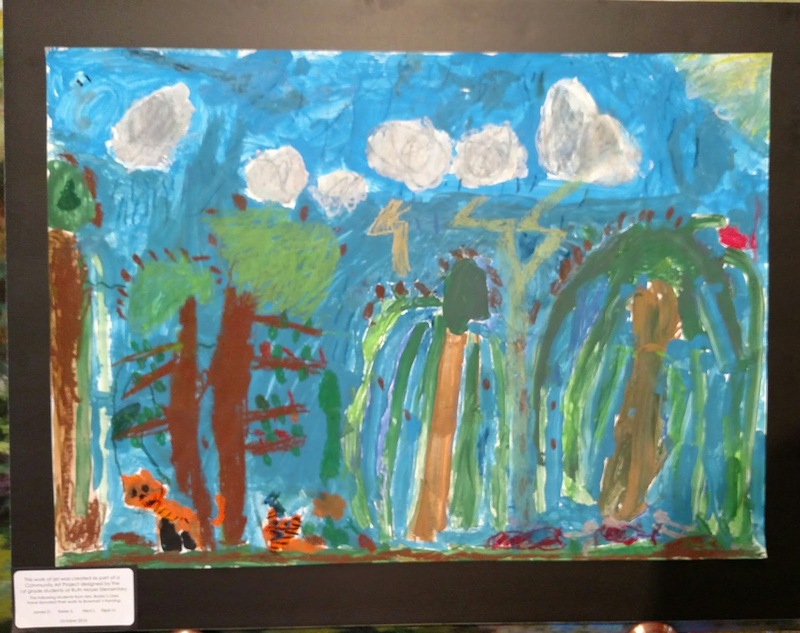 And these days, Owner Ken Bowman is also displaying a nature scene with tigers in the foreground—a collaborative work painted by students in Becky Brady's first-grade class. "Public display of the work should hopefully instill some confidence in the kids," Bowman says. "For them to know what they are doing is getting positive attention can do nothing but good." Julie Keller, owner of Belladance, also has artwork on display—paintings by Beverly Erschell fill the dance studio. And now, children's artwork also is displayed. "Hopefully this may have given them the inspiration to pursue their love of painting in the future as well," Keller says. "The first grade teacher, Amber McDowell, was such a great trooper when she came up to the studio. I taught the class a quick Halloween routine, and she was an excellent dance assistant. It was certainly was a lot of fun to see a big group of both boys and girls enjoying dance at my new studio location." Artwork given to the Fort Thomas Police Department. FTM file. First-grade teacher Kelsey Wind took her class to Fort Thomas Central, where students presented owner Barb Thomas with a painting of a flower and butterflies. "This piece is perfect for Fort Thomas Central because the art of gifting is so much fun and brings happiness to everyone," Thomas says. Everett says it was a beautiful day to walk around to local businesses with Hurtt's class. "The students were all so proud of their work and wanted to know where everyone was going to be hanging their work," Everett says. "The representative from each business was welcoming and genuinely thankful for the student work. Some of the businesses gave out coupons, goodie bags and took classes on a tour, which was a very unexpected and added surprise." When the children delivered the artwork, Thomas says they were both excited and well behaved. "I explained to them our duties as a community gift shop and they responded with wonderful questions and smiles," Thomas says. 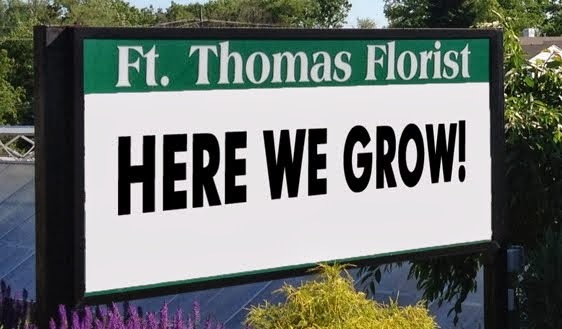 "We are all part of our Fort Thomas community and it is everyone's responsibility for the beautification. Having their artwork displayed around town in our local businesses is a visual reminder that everyone has a part." Bowman says it's important for local businesses to support educational experiences—and it's important for children to develop a connection and comfort level with others in their community, which is exactly what this project helped foster. The project also helped teach children to think local first for something they might need, Thomas says. "If it works out, great, you will contribute to supporting local," she says. "If the solution is outside the community, at least you started with local options first. Supporting local is a lifestyle we learn through our parents, friends, teachers, community, etc., and starts at a young age." Valentine also believes in the importance of community and connection. "I can't think of any better way to thank the community that supports us by giving back as much as possible to the kids of this town," she says. "I have many older folks who come in to FTC and say, 'I remember when this place as the fivve and dime,' and they are filled with pleasant memories of getting to go there. It's so powerful for me to think about the kids who spend time at the shop with their families or friends, coming back to Fort Thomas in five, 10 or 50-plus years and saying, 'I spent many days at FTC while I was growing up.'" More artwork on display. FTM file. Everett says the project also provided real-world experience for her young artists. "In my class, students are taught artistic behaviors that include planning their work, working on their craft, reflecting and revising their work and then ultimately sharing their work with the public," she says. "My first graders are just beginning their journey in my class, 'thinking like artists.' Having their art in the community emphasizes that their ideas are important and worth sharing with a larger audience. ... 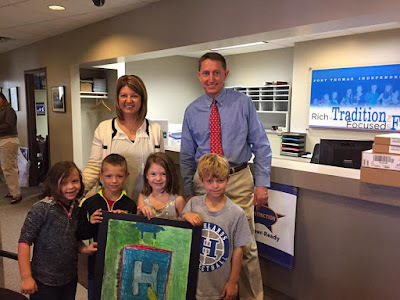 The kids were very proud of their finished work and it showed as they each delivered art around town." Keller says she and her husband have always encouraged their own children to have limitless boundaries in art, and that there is never a picture-perfect tree or flower. This results in a deep sense of pride associated with the work. "I believe, as a community, we have to do our very best to inspire, encourage and motivate the creativity of our future generation," Keller says. "All of the children in our school system are incredibly blessed to have the most incredible opportunity to pursue their love of all areas in art, dance and music. I truly look forward to seeing more of their art displayed around our town. It will definitely add an abundance of beauty and smiles."